Holiday Parties. Customer Appreciation Events. Team Building and More. Graduations. Reunions. Pool Parties. Birthdays. ANY EVENT that need FUN! Ready to start planning your perfect event? Contact us now to learn more. Looking for a Southern California Entertainment Company you can trust? Outstanding customer service – Everytime! Delivering on my promises – Everytime! A reputation for integrity and honesty – Always! Creativity and Energy – At every event! This isn’t a job. It isn’t even just a profession. It’s a calling. Creating memorable events for every person, couple, or company is very simply my passion. Entertainment is in my blood. I have met with thousands of clients and helped them choose entertainment and lighting options that would be the best match for their event, their vision, and their guests. It doesn’t feel like work when you are helping a bride and groom visualize what they always dreamed their special day will be like. It is equally exciting to collaborate with a corporate planning committee on how to create an event their employees or clients will never forget. Words just can’t describe the joy, the satisfaction, and the honor I feel when my clients have included me in such important events in their lives. I have over 20 years of experience working as a DJ/Emcee/Event and Lighting Designer. Just as important: I have the heart. I genuinely love what I do. It shows in my performance and work ethic, which explains why we’re the trusted Southern California entertainment company you’ve been hearing about. Are great DJs born or is it a learned talent? BOTH. It takes the right personality to do this profession justice. You obviously can’t be shy, but no one wants a loud mouth DJ either. It takes listening skills, a love of people and of music, and a desire to please. It also takes experience to really get it right. In my 20+ years in business I have learned how to get the most reticent guests out of their seat and having fun so everyone goes home with memories of the great time they had. The impact and drama that we can create with lights is something to behold! 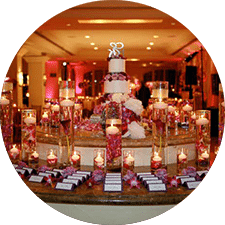 Uplighting, custom monograms, spotlighting, and dance floor lighting sets the mood. Many people find that they can spend less on their other decor because of all of our gorgeous options. We have what you need to create awe and drama at your Orange County and Southern California special events. Weddings should be beautiful as well as fun. Learn more about how we can make it so. 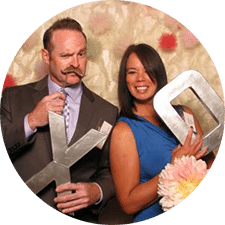 Give your guests the chance to get in touch with their inner goofball with Orange County – Southern California’s popular photo booth from Steve Burdick Events. If you have been to an event in the past few years, you have probably experienced a photo booth. When run properly, photo booths get your guests out of their chairs and engage them in the fun. Watch them go from the dance floor to the photo booth and back again, laughing and having the time of their lives. Simply put – We get it! We would love to hear any questions you might have, or to begin planning your event. Contact us today to get started! 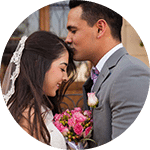 “Steve was recommended to my husband and me by our venue and we are so happy we chose him. 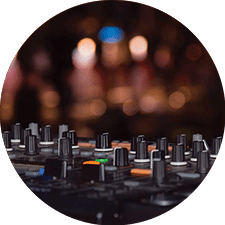 Steve is everything you would want in a DJ – super outgoing, friendly, genuine, professional, organized, and knows his music 🙂 He was very easy to talk to and get to know, and he could quickly pick up what kind of couple we were and what kind of wedding we were looking for. The wedding itself went amazingly. Steve kept all of our friends up and dancing the entire night! We loved the energy. Contact us today to plan your event.  © 2017 Steve Burdick Events.